This is an interesting little Special OPS 'behind the enemy lines' WWII B-Movie directed by Harry Keller. 'In Enemy Country' is his last feature film as director. The Germans have a new 'sound-sensitive' killer Torpedo ('Wunderwaffe') which causes panic among the Allies. Not a bad story idea, unfortunately, the presentation does not really succeed. The script is just as holey as a Swiss cheese! Bad editing? The movie could need a few extra minutes here and there to make things clear. 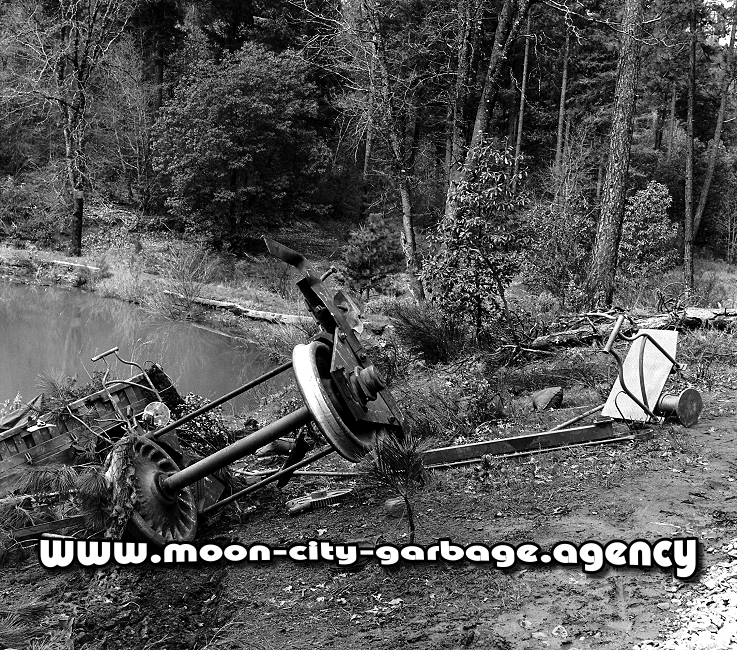 The production is actually upper class, with top personnel in almost all departments. 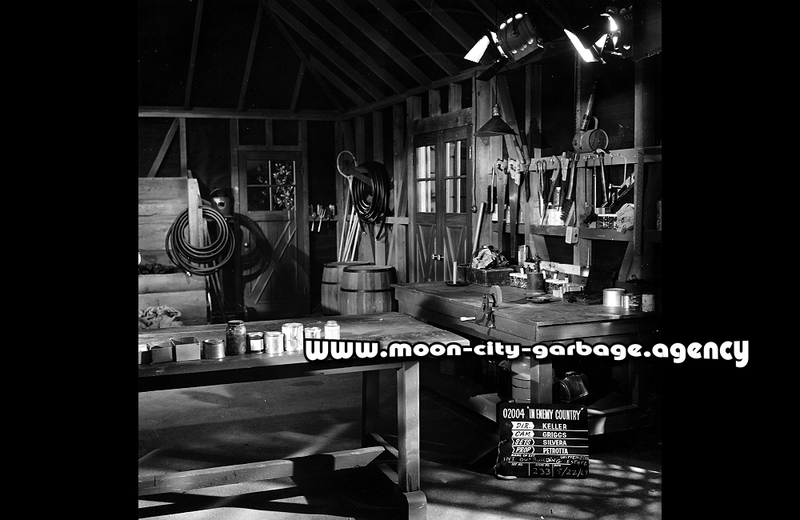 Set Decoration Supervisor Darrell Silvera (1900–1983) for example, a true Set Decoration Titan! 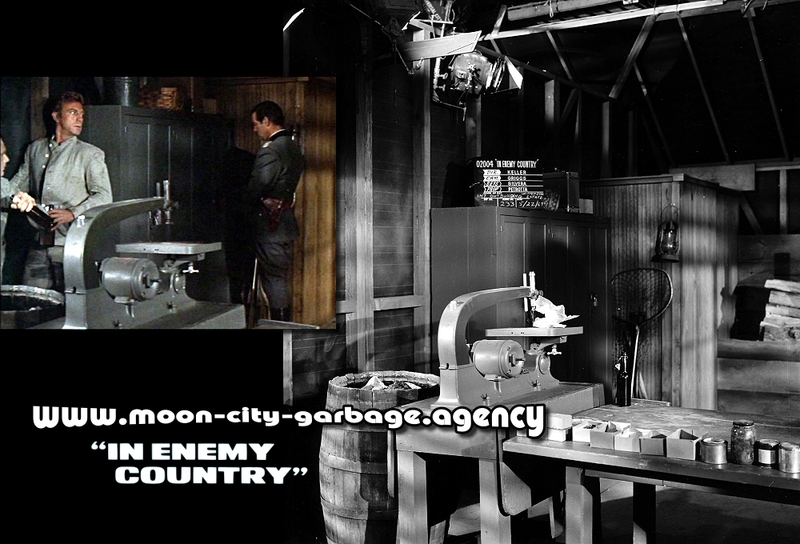 The famous Title Designer Wayne Fitzgerald did the lively beeping title sequence for 'In Enemy Country'. main and end title sequences ('The Green Berets', 'The Secret of Santa Vittoria', 'Wyatt Earp', 'Total Recall'). The Makeup work was handled by Bud Westmore. Cinematographer of the show was Loyal Griggs. Griggs won the Academy Award for Best Cinematography for the 1953 Western 'Shane'. 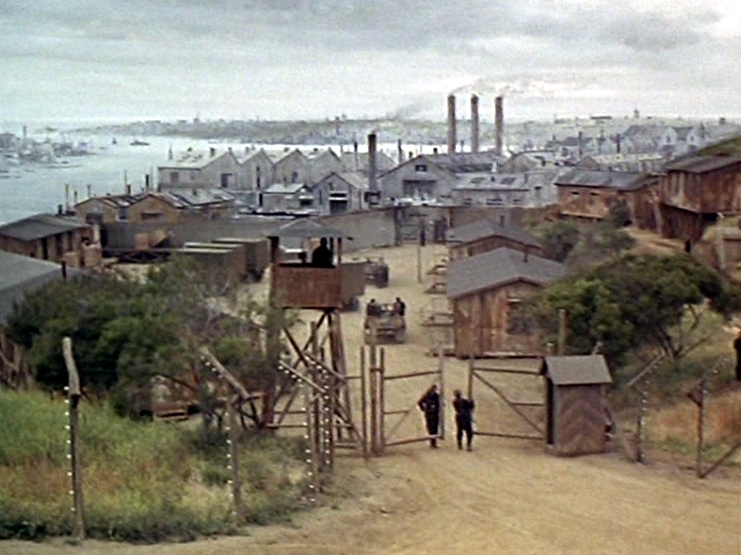 Matte Painting legend Albert Whitlock obviously did not have his best day, his matte scenes are terribly mounted. Some trick shots are amateurishly staged, with only a rudimentary design and expertise. Only very few effects pictures can really convince. The main 'Stars' have a few funny 'comic-book' scenes and they all play with a great B-Movie vibrancy. Charles (Tony Franciosa): "Only the mad know, the impossible is possible." the whole enterprise is surprisingly compelling. 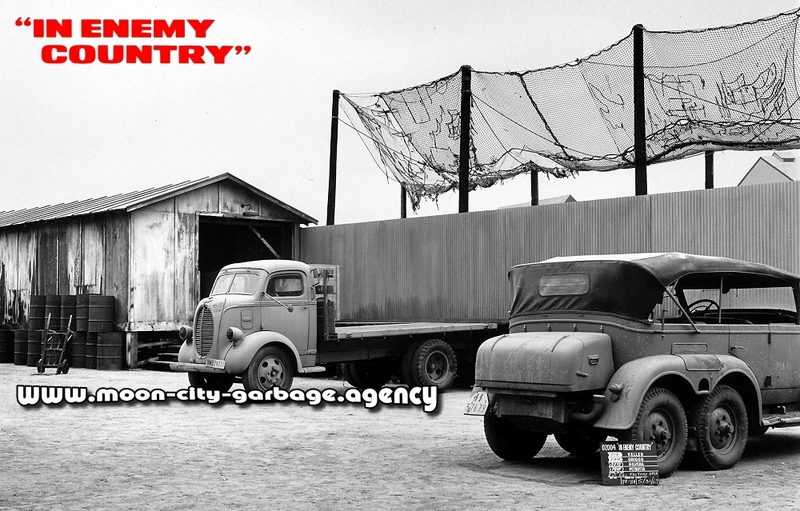 'In Enemy Country' - Set Decoration by Darrell Silvera. 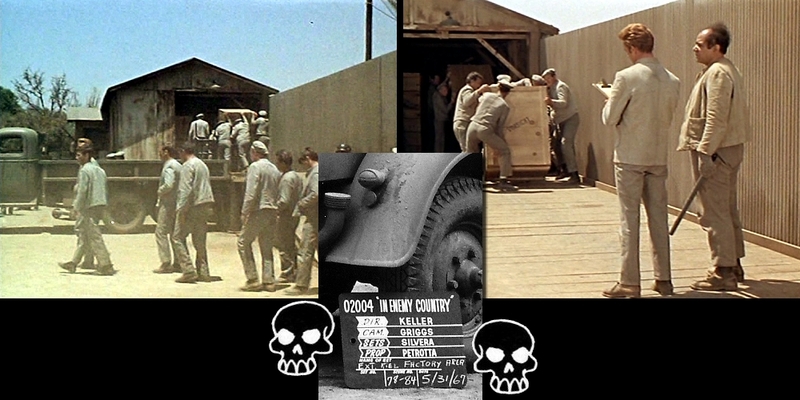 'In Enemy Country' - Several scenes were shot on the backlot of the Universal Studios, 1967.
the set was destroyed in a devastating fire, may 1967.
causing an estimated $1 million damage. Labor Camp near Kiel (Germany). The prisoners work in the torpedo factory (grey houses). Cheap-looking matte work by Albert Whitlock - The 'Kieler Förde' (?) and all the grey background houses are painted. The color scheme does not fit at all. Reminds me strongly of the works of 'Eddie Congo'! Whitlock did more scenes for the show, but everything barely worth mentioning and of embarrassing quality. 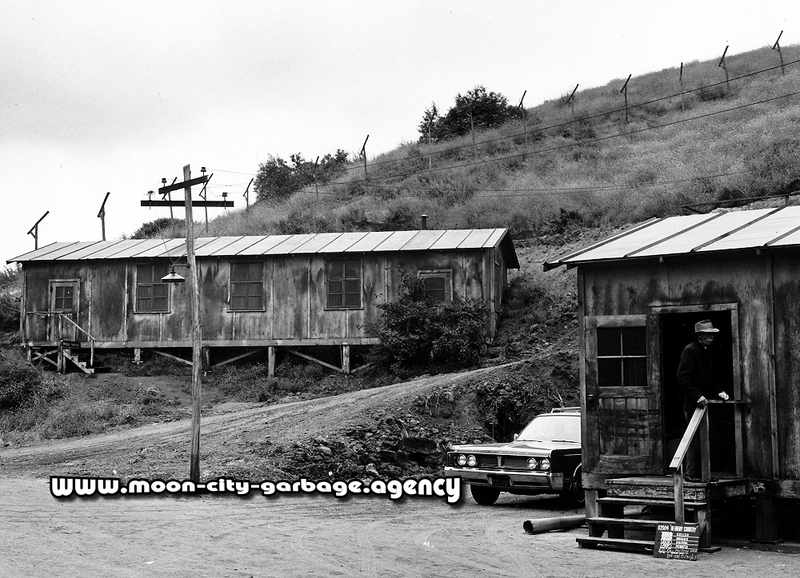 Barracks / housing for the workers of the factory - Set Decorator Darrell Silvera. The prop master of the show was veteran Vic Petrotta Sr. (1915–2009). 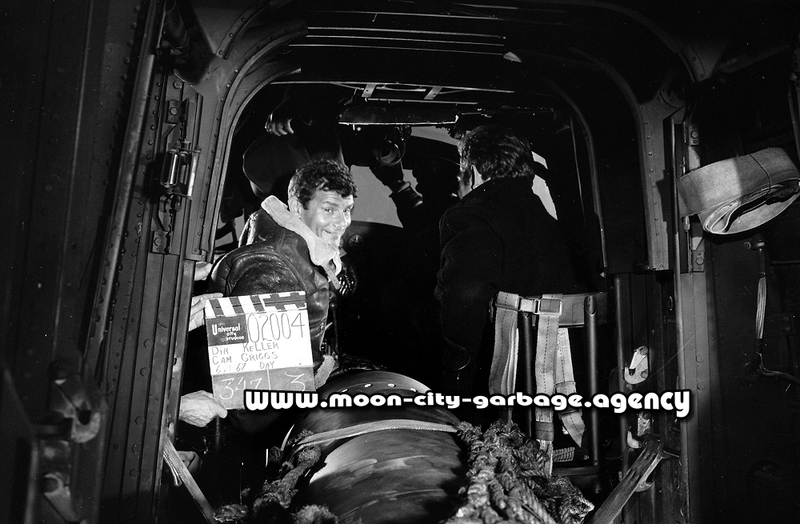 Tony Franciosa - Scenes filmed in the Labor Camp of the Torpedo Factory. Barrack in the background. but the Germans have good security guards, Rottweiler and Doberman. Part of the Labor Camp Set with props of Vic Petrotta Sr. The Camp sequence is the show of Michael Constantine (Ladislov). He has fun poking the prisoners with his cattle prod (by prop master Petrotta). John Marley (1907–1984) plays a fisherman from Kiel (Germany). 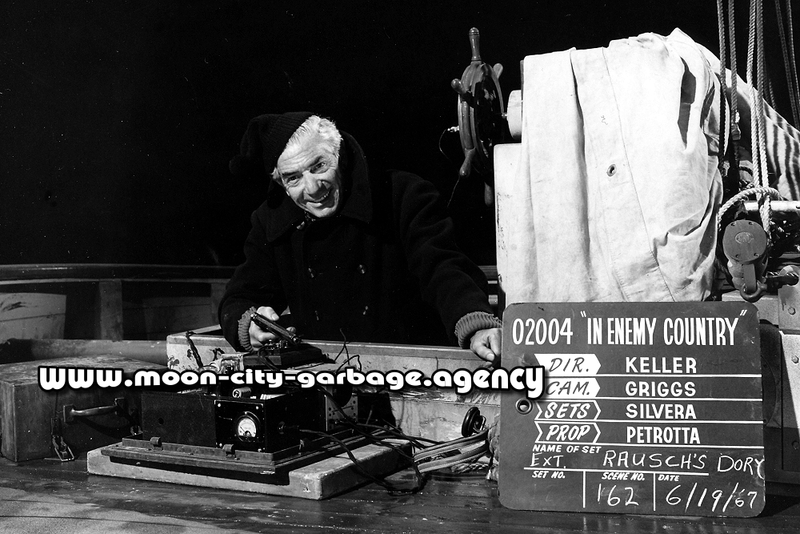 From his fishing boat he receives and transmits secret messages. But he is discovered quickly! Well done Studio scenes with the good old rear projection. Character actor John Marley played roles in all genres. He was one of those familiar but usually nameless faces. Marley was a rough homicide detective in 'Blade' and the greedy 'Old Man' in the Western 'A Man called Sledge'. The bombing of the factory is horribly staged. 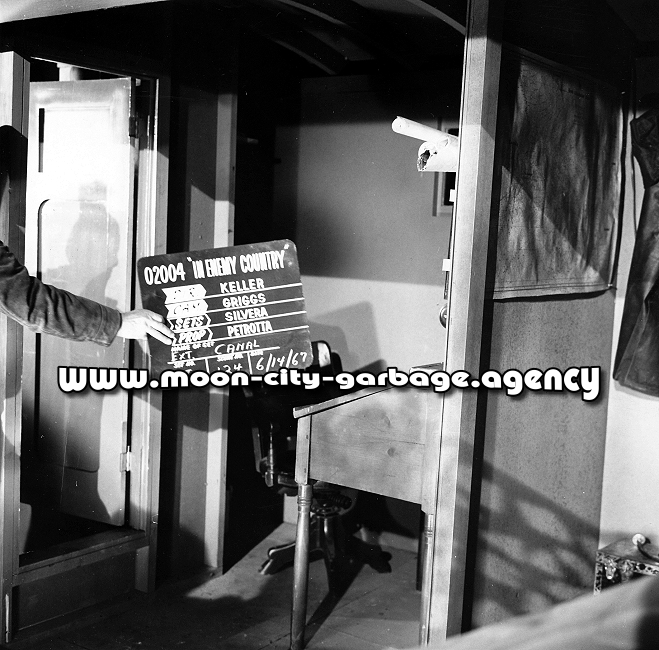 The scenes look incredibly cheap and it seems like they were taken from another movie. The few good scenes look like newly made additions. Here are 2 screenshots of well-made trick scenes. The scene as the fleeing prisoners try to overcome the electric fence looks pretty good. Set - On the small tugboat. The 3 special forces agents managed to get on a small tugboat to pull a torpedo out of the danger zone. But at the end the torpedo was lost and an agent too (Tom Bell). They get help from the baroness, played by Anjanette Comer ('Guns for San Sebastian'). Parts of the Torpedo Factory are brought by train to Poland. The shed Set, prepared with great attention to detail. The long and very successful career of Set Decorator Darrell Silvera started already in the 30s. 'Cheyenne Autumn' and 'Charley Varrick'. An extremely experienced specialist in his field, the Set Decoration. responsible for selecting, designing, fabricating, and sourcing the 'set dressing' elements of each set. Surprisingly, the baron comes in the shed, the boys are hiding behind the filing cabinet. What a scene ...everyone sees the other, but nobody says anything. The last chance to get one of the new killer torpedoes is to steal one from the train to Poland. The locomotive #50 2963 looks like a German one. Where did they film these scenes? The railway wagons with the guards can be uncoupled and they crash in an curve. Set Decoration by Darrell Silvera. The Germans capture the situation, sabotage! The whole train sequence is a mixed bag. Some scenes are cool, Tony cutting the steel cables with the welder, others are not (badly staged rear projection). Sometimes we are in the mountains, then suddenly by the sea ..and back in the mountains! The old steam locomotive is pretty fast. into the mountains to fly it out by plane. An interesting little known B-Movie that gives Tony Franciosa a good lead role. Is there a reasonable release on DVD or Blu-ray of the movie available? See more of Franciosa here:'The Pleasure Seekers', 'Assault on a Queen', 'Fathom'.